The Ada County Highway District wants to encourage and enable more children to walk or bike to school. ACHD has worked with every school district in Ada County to make safe routes to school improvements. ACHD has also assisted private schools. As part of that outreach, the District has evaluated areas around schools with school officials to help identify the best and safest routes. ACHD has installed a variety of features over the years to make it safer to walk to school. Those improvements include school speed zone flashing beacons, paths and sidewalks as well as raised curbs, which provide a physical separation between pedestrians, bikes and motorists. 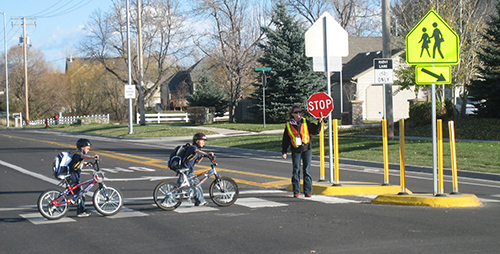 ACHD devotes local funds and resources to provide safe routes to school in Ada County. ACHD’s efforts go above and beyond the Federal Highway Administration (FHWA)’s Safe Routes to School Program, which makes federal funding available through grants. ACHD applies for federal grants, but has historically been a leader in locally funded safe routes to school improvements. Educating children and parents about safe routes and walking and biking safety is another part of the safe routes to school effort. ACHD participates in events to promote safe walking and biking to school. Safety Buttons are available to school age children for free. The buttons blink and reflect, making children more visible. Contact Tell Us for a free Safety Button!